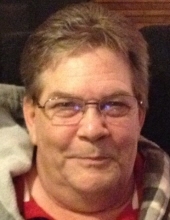 Roger E. “Boxer” Logemann, age 61 of Gratiot, WI passed away Sunday, December 2, 2018 at Meriter Hospital in Madison, WI. He was born December 24, 1956 in Freeport, IL the son of Bruce and Earlene (Clay) Logemann. Roger graduated from Stockton High School in Stockton, IL in 1975. He grew up in Stockton and moved to Warren, IL in 1989 where he tended bar at Smiley’s for 30 years. In 2006, Roger moved to Gratiot where he has resided since. Roger is survived by one daughter: Toni (Steve) Van Denend of Aurora, IL; 5 grandchildren; his special friend: Abby Cottington of Gratiot; his brothers: Michael “Yogi” (Irene) Logemann and David Logemann both of Stockton, and Scott (Jodi) Logemann of Jonesboro, Arkansas; one sister: Connie (Doug) Winters of Genoa, OH; and many nieces and nephews who adored him. He was preceded in death by his parents; and one sister: Janette Logemann in infancy. Roger attended Gratiot Evangelical Free Church in Gratiot. He loved playing darts and was a proud member of ILLOWA Dart League. Roger also enjoyed golfing and was a member of Stockton Golf Course for many years. He will be sadly missed and fondly remembered by his family and friends. A Memorial Service will be held Wednesday, December 12, 2018 at 11:00 A.M. at Erickson Funeral Home (508 Main St., Darlington) with Rev. Glenn Andes of Gratiot Evangelical Free Church officiating. A visitation will be held Tuesday, December 11, 2018 from 4:00 P.M. until 8:00 P.M. at Erickson Funeral Home and on Wednesday from 10:00 A.M. until 10:45 at the funeral home. Online condolences may be expressed to the family at www.ericksonfuneralhome.com. For those who prefer, a memorial fund has been established in Roger’s name. To send flowers or a remembrance gift to the family of Roger E. Logemann, please visit our Tribute Store. A visitation will also be held Wednesday, December 12, 2018 from 10:00 A.M. until 10:45 A.M. at Erickson Funeral Home. Memorials may be written out to "the family of Roger Logemann"
"Email Address" would like to share the life celebration of Roger E. Logemann. Click on the "link" to go to share a favorite memory or leave a condolence message for the family.